Carbon dioxide fluxes from the surface of coarse woody debris (CWD) have been measured in Korean pine forests of the southern Sikhote-Alin mountain range. 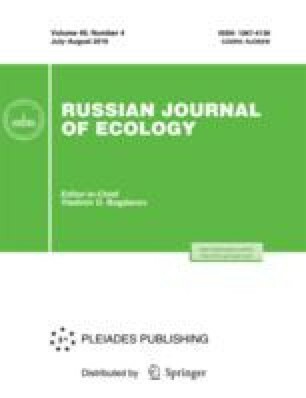 The seasonal dynamics of oxidative conversion of CWD carbon have been evaluated, and average values of the CO2 emission rate have been determined for CWD fragments of three tree species at different stages of decomposition. The degree of decomposition is an important factor of spatial variation in CO2 emission rate, and temporal variation in this parameter is adequately described by an exponential function of both CWD temperature and air temperature (R2 = 0.65–0.75). Original Russian Text © A.V. Ivanov, M. Braun, D.G. Zamolodchikov, S.Yu. Loshakov, O.V. Pototskii, 2018, published in Ekologiya, 2018, No. 4, pp. 275–281. R: A Language and Environment for Statistical Computing, Vienna, Austria: R Foundation for Statistical Computing, 2013. http://www.R-project.org/.